What A Mighty Good Father! Let’s celebrate the men in our lives. Celebrate the fathers, brothers, uncles, friends, and sons in your lives. 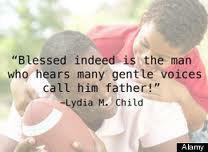 Recognize what the mighty good Father and men in your life mean to you. 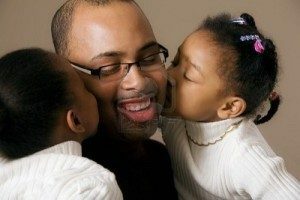 Take this month, to acknowledge the important role that the fathers, both natural and spiritual, play in the lives of their children; as role models, care givers, providers, protectors, and supporters. Acknowledge how men serve you and the women in their lives as good husbands, providers, protectors, supporters, friends, supporters of equality for women in the work place, and who take out the garbage. Thank God for the father, uncle, brother, who will be there if your car stopped or if your heart has been broken and the myriad of other roles that men play in the lives of women and children. This month as we celebrate Father’s Day let’s honor and pray for fathers, who may not be perfect, but who love their children, train their children, protect their children and have good relationships with their children. I challenge men and women to share positive comments and reflections about your father, father figures, grandfathers, mentor and committed men. Please share them. A couple of years ago on Radio station 1200 AM in the city of Detroit, John Mason, of Mason in the Afternoon, was asking for positive reflections and comments about one’s father, grandfather or a father figure. One reflection, by a man who called into the radio station to comment, touched my heart. He stated that his father taught him many things by his actions. He said he learned how to be a father and the protector of his family from his father. “When I was about 7 years old I went “trick or treating” on Halloween with some friends”, said the caller. “ A bigger boy stole our bags. All I could remember was seeing a flash go by and jump the fence. Next thing I knew I had my Halloween bag back. It was my father who jumped that fence. He had been watching and covering me all the time”. That story brought tears to my eyes because the actions of the father symbolized the love the heavenly Father has for us in that he watches over us and protects us. For the now grown caller it taught him how to watch over his family. Another gentleman called in and stated he “learned how to respect women because of how he saw his father respect and treat his mother”. The admiration Kimberley Bracey has for her father shines through every time she speaks of him. Kim Bracey will tell you she thought her father was “God” for the longest because he provided for her and was there every time she needed him. Rene Wallace shared that her over 70 year old father , who has now passed, still talked as if this middle aged daughter was his responsibility. Jeanette Johnson’s father has been dead for over 12 years but she talks about her father frequently with love and respect. Her honor and respect for his wisdom radiates from her heart for this man who only had a third grade education, but was full of wisdom , strength, and integrity who provided for his children and adored his wife. Her father owned land and property and fed his neighbors who were poor. When she speaks of him you can hear and feel the respect and honor she has for him. It was touching to hear their comments. Three things you can also do to show your appreciation. 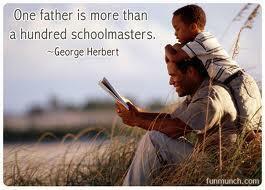 Brag on the good father and/or man or men in your life all month long not just on Father’s Day. Say “Thank You”. Let him know you appreciate him. Men need encouragement. “We should seize every opportunity to give encouragement. Encouragement is oxygen to the soul.” “A word spoken in due season, how good is it! Proverbs 15:23b. Encourage him to get a Check up. Men’s health issues significantly impact everyone around them and far too many men do not ever see a doctor unless there is something seriously wrong or a partner or spouse makes the appointment for them. A good time to do just that is June, which is Men’s Health Month. Men’s Health Month is intended to increase awareness of preventable health problems and encourage early detection and treatment of disease among men and boys. Pray for the good father and men in your life. 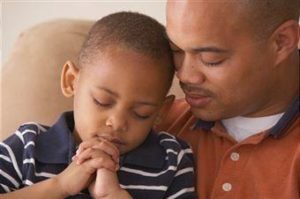 Here are some specific prayer points for men in general and for fathers. -Men would seek God and honor His faithfulness, wisdom and truth. -For fathers identity to be centered in Christ-like servant leadership. -For vision in their lives that would serve family and serve and advance God’s purpose. -To be the honorable priest and leaders of their homes. 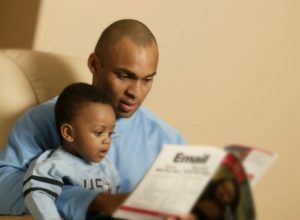 -We call fathers back to their children to love, nurture and teach them. -That fathers will look to God as the ultimate spiritual head of their homes. That children will see the character of the heavenly Father in the lives of their dads. 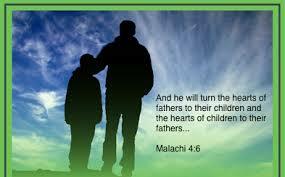 -Fatherless children- that loving and nurturing father figures and mentors will arise in their live. -Men’s Health- June is Men’s National Health month pray that fathers and men will obtain. prostate cancer and other physical examinations. -Boys who need father figures ; may they find mentors and father figures..